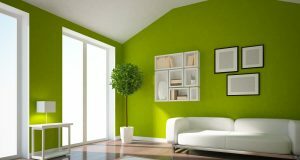 Over the past few generations paint for interior walls has tended to have three basic finishes, though other types of finishes have appeared on the market more recently. This was once the most common type of paint finish, and it is still very common for outdoor use. Gloss paint has a shiny finish that is quite good for repelling water and other moisture. This makes gloss paint quite stain resistant, and for many years it was the only choice for situations prone to staining. The downside to gloss paint is that it will show any imperfections in the underlying surface, so the walls have to be merticulosly prepared before painting. This is literally a less shiny version of gloss paint. It is almost as water and stain resistant as full gloss paint while still being better at covering up minor surface imperfections. Many home owners considered this a fairly good compromise. It also had less of a chemical smell when frying. This was the third paint option, and probably the most popular for indoor painting over the last two generations. Matt paint has a pleasant chalky texture that does not directly reflect the light, so it covers up minor surface imperfections. Its only reals disadvantage is that is isn’t nearly as stain resistant as gloss paint. This is a more recent development in paint and considered the best option in most interior applications. Eggshell finish has a very light sheen. This light shine cover up surface imperfections almost as well as Matt or flat paint, yet the paint itself is almost as stain resistant as full gloss paint. As an added bonus these modern paints tend to be quite environmentally friendly.